Competitors will reach speeds approaching 40 miles per hour as they zip down the 400-foot-long icy chute at next weekend's annual U.S. National Toboggan Championships. A Maine television reporter takes a self-portrait Friday afternoon while zipping down the toboggan chute. 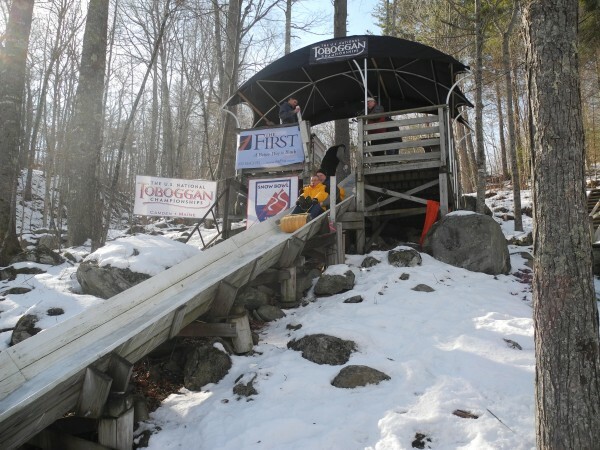 Beginning on Friday, Feb. 7, the hill at the Camden Snow Bowl will be alive with spectators and participants as the 24th annual U.S. National Toboggan Championships takes place. CAMDEN, Maine — Without hundreds of screaming competitors and thousands of cheering, laughing onlookers on Friday afternoon, the icy toboggan chute at the Camden Snow Bowl was quiet and still. In a week, though, all that will change in a flash as the first racers of the 24th annual U.S. National Toboggan Championships plummet down the 400-foot run. The event, which kicks off the evening of Friday, Feb. 7, is a big deal in the midcoast region. An estimated 6,000 to 8,000 people are expected to watch the races during the long racing day on Saturday, as a total of 425 teams compete for bragging rights and glory. Ben Hazen of Andrew’s Brewing Co. in Lincolnville was helping Maine television personalities and others make it safely down the chute as part of media day on Friday. He said that his company will field five teams of racers this year. When asked why, he smiled. “The excitement, the camaraderie,” Hazen replied. Holly Edwards, who helps to promote the event, said that there is still space for would-be racers to sign up. They can find the specifics for the toboggans posted online at the event’s webpage, or they can borrow one of the 20 sleds that the town of Camden makes available for the community to use. Because racers can hit speeds of nearly 40 miles per hour when they zip down the chute on their sleds, they are encouraged to tuck in their elbows and legs and wear old clothes, as it’s possible to rip or burn outer layers because of friction from bumping against the sides. Edwards said that crewmen and women from U.S. Coast Guard Station Rockland will be on the ice of Hosmer Pond, where racers come to a halt, to make sure that the path is cleared before the next toboggan hits the chute. She encouraged spectators to wear cleats so they won’t slip and fall on the ice around the chute and perhaps inadvertently become part of the show. There’s more to do than watch the racers, she said, with the annual Chili and Chowder Challenge, mechanical bull rides, bonfires, food vendors and live music. For the second year, there also will be beer and wine samples from Maine’s top brewers and vintners available at the Down the Chute Beer and Wine Challenge. But for those who can’t make it to Camden — or who prefer to remain in the warmth and comfort of their own homes — for the first year ever, it will be possible to watch a live stream of the racing excitement. Ned Lightner of Belfast Community Television works part-time at the Snow Bowl and will rig up cameras at both the top of the chute and part way down, to catch the rapid descent of the racers. The coverage will run from 4 to 6:30 p.m. Friday, Feb. 7, and 8 a.m.-4 p.m. Saturday, Feb. 8, at www.camdensnowbowl.com and at www.MaineCoast.TV. The broadcast also can be seen locally in Knox County on Time Warner Channel 7 on converter boxes or Channel 121-7 on digital TVs without boxes. For more information, please visit the website www.camdensnowbowl.com.